For the lady in a potentially dangerous labor environment, steel toed boots for women are the way to go. Steel toe boots offer support and protection for the hard-working woman, but don't be fooled by their industrious purpose. Some are kind of cute too! While some workplaces pose more potential hazards then others, if employees use the proper safety equipment they can help protect themselves from dangerous situations. Just as a hard hat protects the head, sturdy steel toe shoes and boots are vital for protecting a woman's toes from heavy falling objects that could cause potential harm. For this reason, women who work in or frequently visit construction sites and manufacturing plants would be wise to invest in a good pair of steel toe boots. Steel toe boots for women are constructed with a steel cap in the toe of the boot that shields the top and sides of the toes. They are made from leather, rubber or man made materials and come in a variety of styles to suit different tastes. Similar safety boots, that use a strong composite material to protect the toes rather than steel, are available as well. Steel toe boots are designed to be tough and durable, in order to safely take a woman through long hours at her work site. While safety is always the primary consideration for makers of steel toed boots for women, manufacturers realize that women like a choice of shoes; and there are now several different styles of safety boots on the market. For the no-nonsense kind of gal, there are plenty of simple, strong and plain styles available. For the lady who loves to take her bike out after work, there are motorcycle boots with steel toes. For the woman who needs to go from inspecting a prototype vehicle in the plant straight to a meeting with managers at the development center, there are steel toe footwear options that will allow her to maintain her professional look and keep her toes intact at the same time. Steel toe boots offer different levels of protection, since different environments required different safety precautions. In addition to the steel toes, some boots offer puncture resistant soles to protect against nails or other sharp objects that might be sticking up. Others protect against electric shock, and yet others are made to protect against chain saw accidents. Before you buy, make sure you're getting the proper type of protective footwear for your particular situation. How can you locate a pair of these boots? 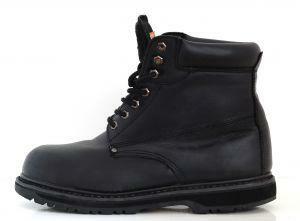 Steel toe boots can be found at shops that specialize in work clothing as well as common department stores like Sears. If you prefer to shop from the comfort of your living room, there are several online shoe stores that you can check out. You'll sacrifice the convenience of trying on the boots for the best fit, but what a selection! Here are a few websites to check for steel toed boots for women, but there are plenty more out there! Zappos has a great selection of steel toed boots for women and shoes from top names like Dr. Martens. Timberland also has great work shoes and boots, including some that look like hiking boots and some that will look fine in the office. The Working Person's Store has plenty of styles of women's steel toe boots from which to choose. Caterpillar also sells superior steel toe boots for women. BootBay.com is an online boot store with great prices and a great selection.